I am so happy that my peonies are opening. Finally! They seem to be the last on the block to be breaking out of their tight buds, and I think it’s just because I have been waiting (un)patiently for it to happen! 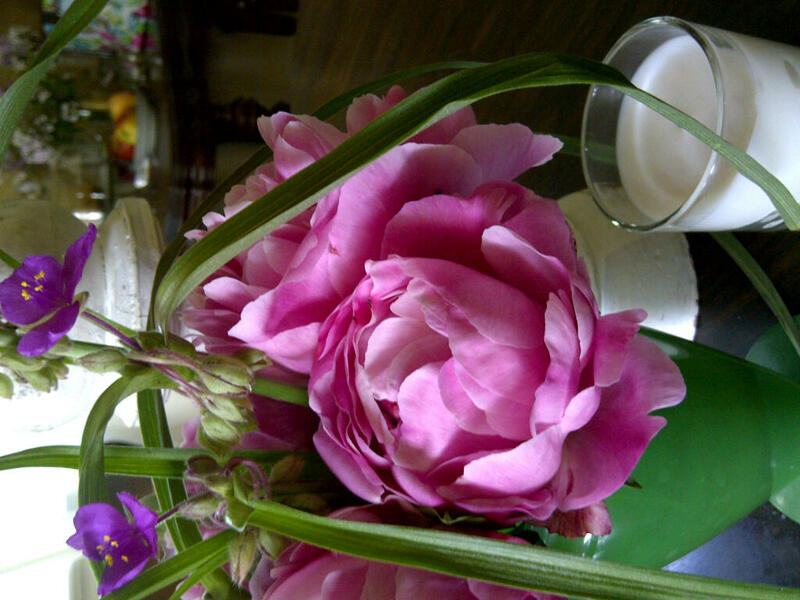 The peony is one of my very favorite flowers, I find them so beautiful and old fashioned. A giant bouquet is such a romantic sight, and some are as fragrant as roses.The big gathered bouquets are so blowsy and casual, but so, so pretty. I can’t help but cut flowers when summer begins, and fill my house with vases… large, tiny, tall and slender or short and squatty, I love them ALL and put them in nearly every room. I have a tendency to pick up old or pretty vases at garage sales and flea markets even though I don’t actually need them, just because knowing they will be filled with flowers, makes me HAPPY! A bouquet definitely doesn’t have to be from a flower shop to make me smile (though in the winter it is a welcome treat), I love it just as much (probably more) when my husband stops at the roadside to pick a bunch of colorful blooms just because he knows they will tickle me! I get that same satisfaction from cutting from my flowers and herbs in the yard; there is just something about being thankful and bringing them inside to enjoy up close and personal that makes me think of simple gracious living. By gracious, I do NOT mean fancy or expensive, but rather living in an aware way that makes a house feel like a home. To me, it’s small things like candles and flowers, a bowl of nuts on the table, pretty plates from a tag sale or discount shop, or tablecloths that make things seem just a little bit more intentional. I think that it is a version of “taking the time to smell the roses” or peonies, or lemon balm, or a campfire, that makes each day feel special, even when things are stressful or hurried. Sitting in the backyard with a glass of iced tea or lemon water, or coffee in the morning at the beginning of the day just gives me a bit of peace to carry with me. 🙂 I feel that being in the moment and being grateful, soaking up the small things in life, are just as important to good health and well-being as feeding our bodies the right nutrients. 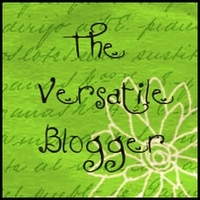 A daily dose of Vitamin T, thankfulness! 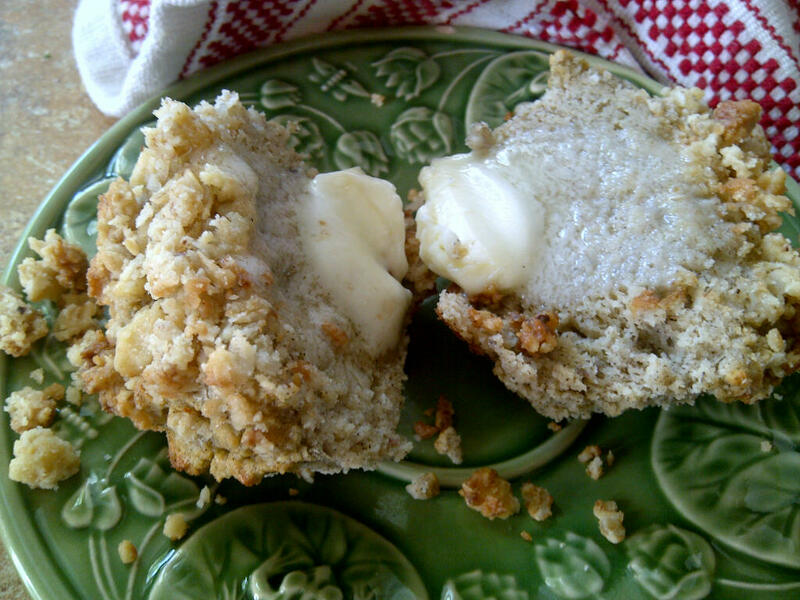 Sometimes we miss the comfort of baked goods, and want something warm and yummy yet gluten free! I also strive to keep the carbs on the lower side, just to help maintain weight loss goals. This recipe uses a base of coconut flour, and the original recipe was found at the Tropical Traditions website. I altered it a little and added a streusel topping. Why? 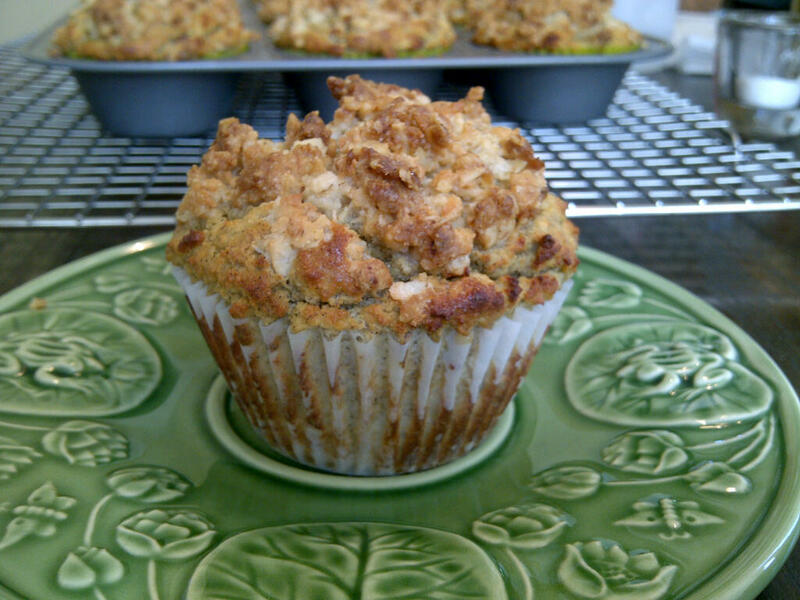 Well, because who doesn’t love streusel on a muffin?! MMMMM. I like this recipe as it stands, but my hubby thought they could be a little sweeter. If you prefer a sweeter muffin, feel free to increase the honey or Truvia to your tastes. It seems like a lot of ingredients, but it actually went together pretty quickly for me. The coconut flour is much more absorbent than other flours, which has to be taken into consideration if you want to alter the recipe for your own needs. Next time I make these, I will likely add a dash of cinnamon and maybe nutmeg, (or even cocoa!) but we thought they were really tasty just like this! To make the muffins: Heat oven to 350. Beat the eggs in a large bowl, then add the melted butter, coconut oil, milk, buttermilk, honey, vanilla and Truvia. Combine well. In a medium bowl, combine coconut flour, buckwheat flour, baking powder, baking soda and salt. (I use a whisk to combine and be sure the ingredients are evenly distributed.) Slowly add the dry ingredients into the egg mixture until combined. Add bananas and mix. Spoon batter evenly between 12 lined muffin cups. 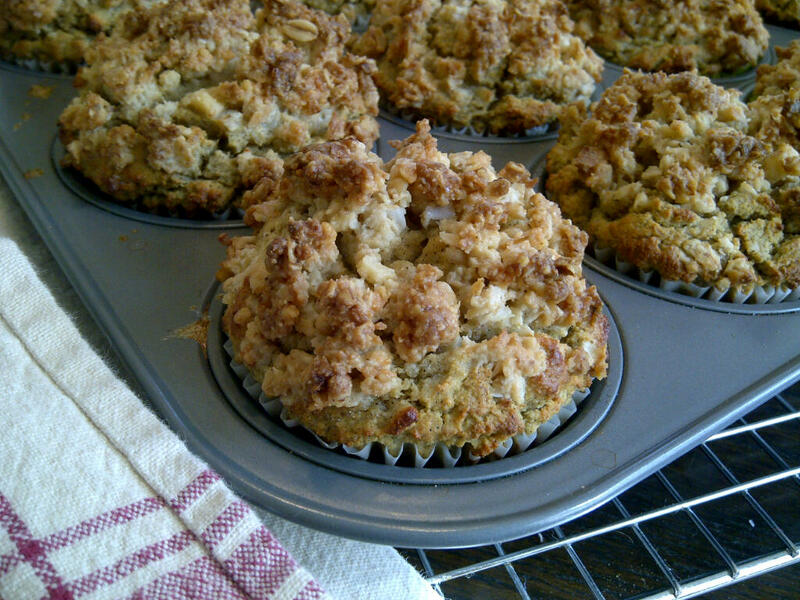 Top with streusel (below), and bake for 20 minutes or until set. To make the streusel: Combine almond flour, walnuts, erthyritol and coconut in a food processor until combined but not fine. Add the butter and process until it begins to clump together. 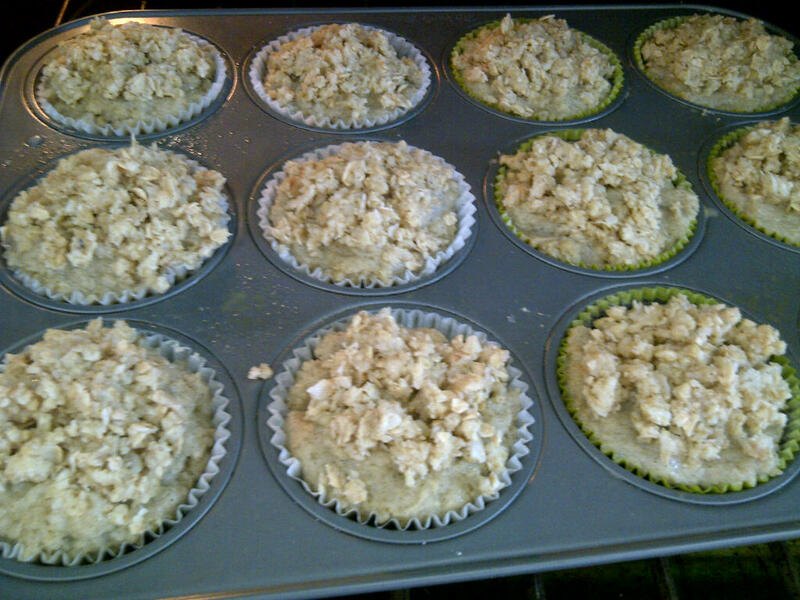 Brush the tops of muffins with the egg white (to help the streusel stick to the muffins, as the batter is dryer than a typical muffin.) Top with streusel and pat down lightly. 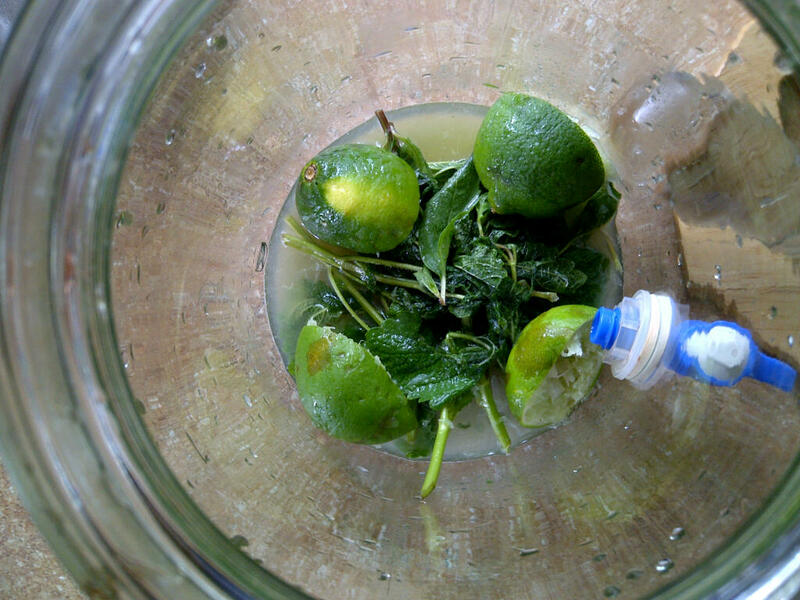 One of the summer drinks that I really love, is a garden fresh mojito, mmmm! This concoction of mint, lime and rum is refreshing and crisp, perfect for summer weekends. 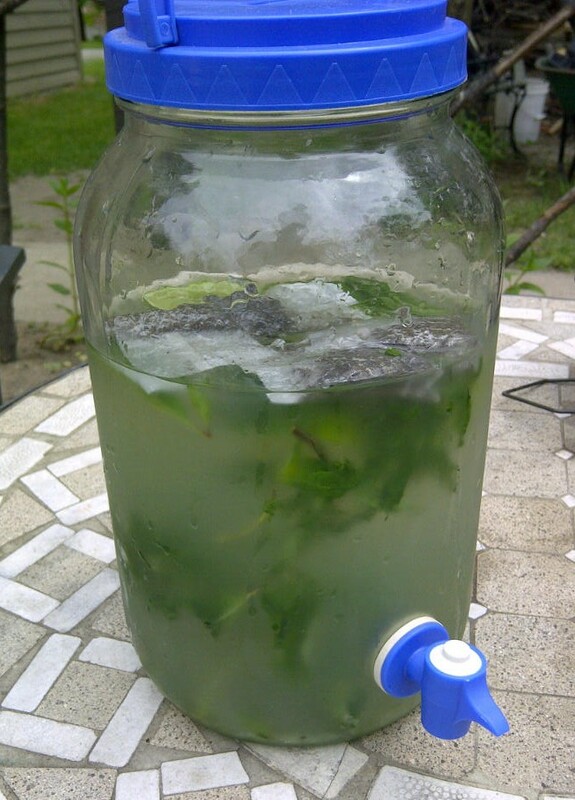 Even without the alcohol, the flavors of lime and mint are wonderful together, and in this sun tea recipe, I also added a little Truvia for sweetness and green tea bags (gluten free) for a dose of anti-oxidants. 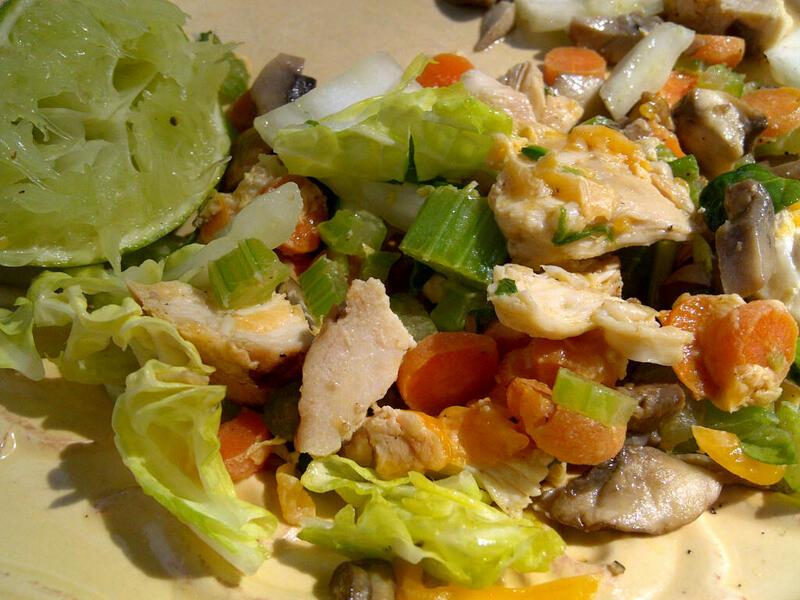 On top of tasting delicious, the ingredients are good for you! 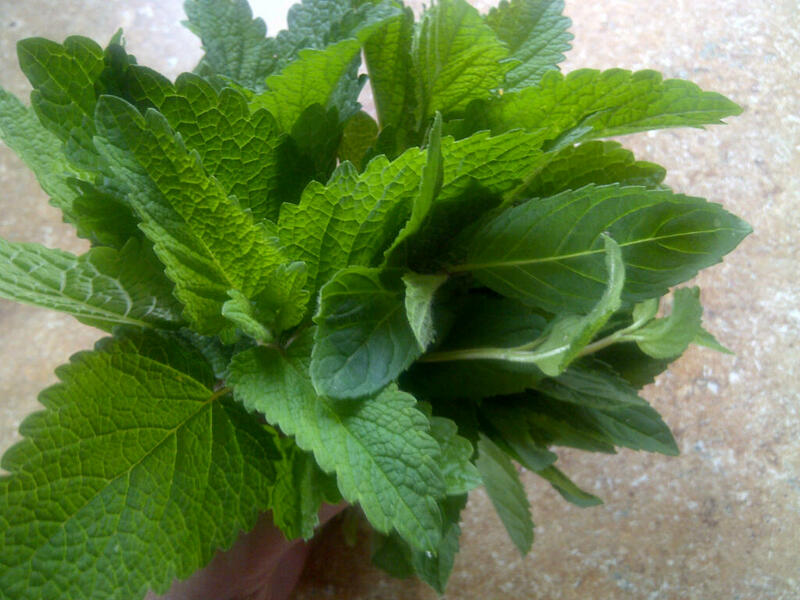 Lemon Balm is one of those fragrant herbs that I have had forever in my herb garden, probably because it’s one that mom always grows and uses herself. (She is to blame for my interest in herbs and healing!) According to the encyclopedia of spices, lemon balm has many medicinal uses such as helping relieving spasms in the digestive tract, relieving stress and tension (which can help with migraines), aiding in treatment of insomnia, as well as helping to fight cold and flu due to anti-viral properties. Nice benefits from a glass of iced tea! 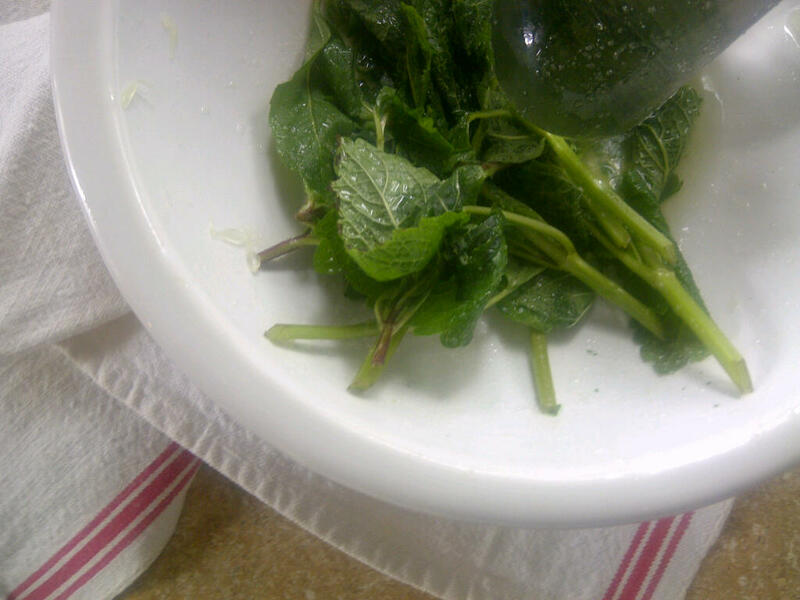 I first gathered a handful of lemon balm leaves (on the left in the photo above) and mint leaves (on the right) from my herb garden. The smell is so fresh! Next, using a mortar and pestle, I muddled the herbs along with the juice of 1/2 lime and 2 tsp of Truvia to release the oils and juices. Truvia has a granular texture like sugar (while being free of carbs), and the texture acts as an abrasive to help grind the herbs. Next, pour the herbs and juice into a sun tea jug, and add the rest of the fresh lime juice (from 2 limes total), and 4 green tea bags (gluten free). Fill the jug partway with water and set outside in the sun (where did my sun go for this pic?? )… where the warmth will brew the tea over the course of a couple hours. The longer it steeps, the stronger it is likely to be. When it’s reached the stage you like, remove and chill, serve over ice. 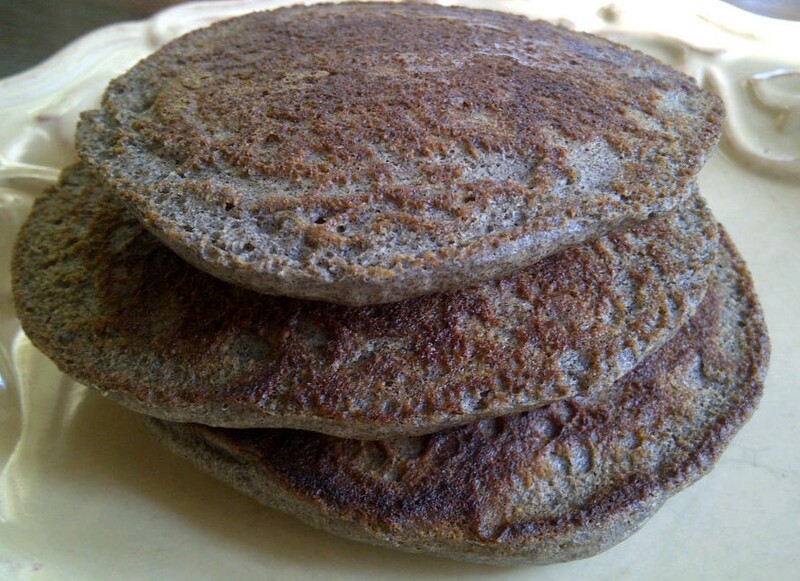 Since we have gone gluten free, I have been keeping my eyes open for a good buckwheat pancake recipe that my family would enjoy, as buckwheat pancakes were always our favorite! I also wanted the recipe to be lower carb so that we could eat it without guilt. I have seen lots of recipes that looked yummy, and decided to combine and tweak to come up with one that would satisfy our dietary choices. 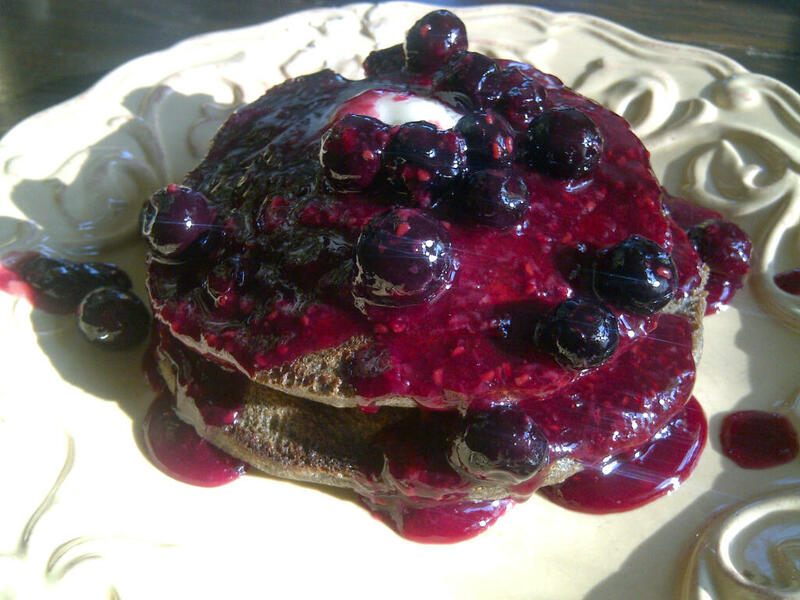 This one combines buckwheat flour with almond flour (lower carb, not no carb), and I have to say, the boys RAVED about it! It was so gratifying to hear my teenager telling me that these were the “best pancakes ever!” (I plan to make another batch soon for the freezer so that he can pop them in the toaster in the morning.) I can’t guarantee you will feel the same way, but I do hope you enjoy! Heat griddle to 325 degrees. Combine all dry ingredients in a food processor and pulse until mixed completely. Add wet ingredients and blend. When griddle is hot, grease with butter and spoon batter into smallish pancakes. (I was able to make 8.) Cook several minutes until the first side appears to be done and is starting to brown at the edges. (My pancakes did not get the traditional bubbles before flipping.) Flip and cook another minute or so. 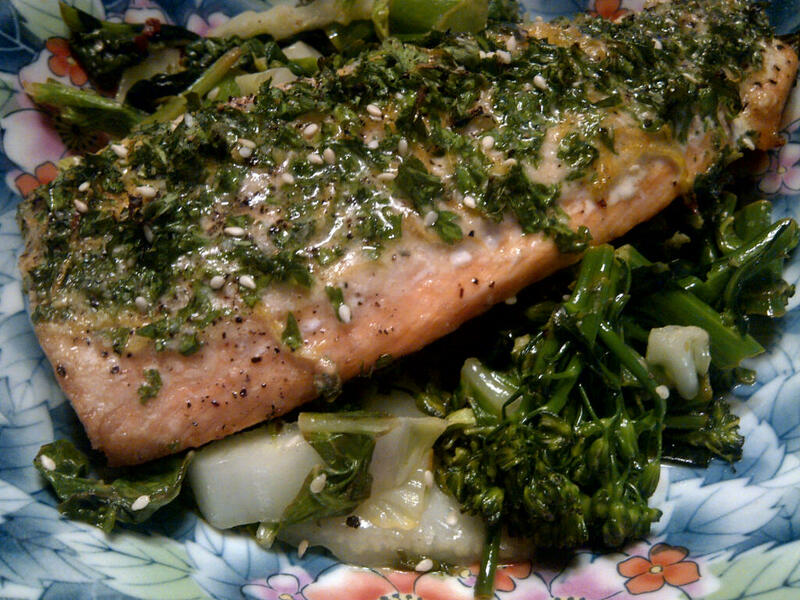 Serve with butter and berry sauce. 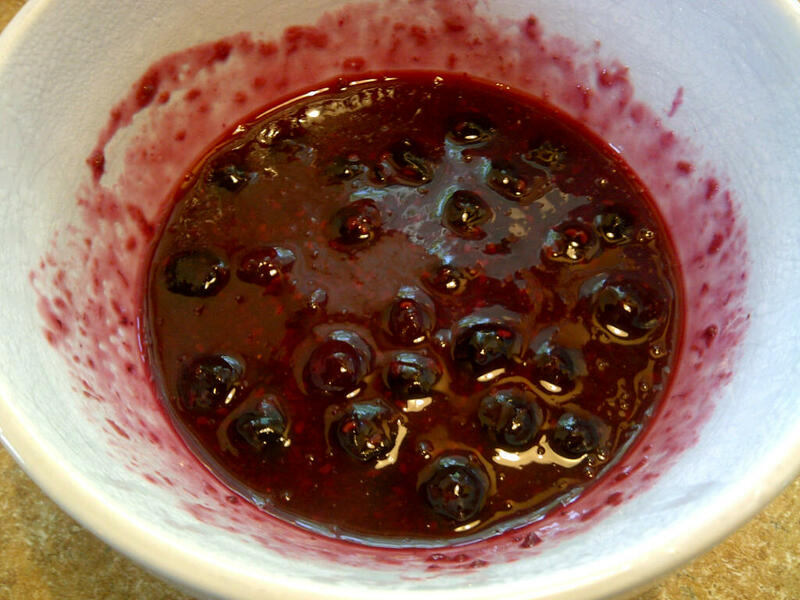 Heat ingredients together until the blueberries begin to soften. Serve over pancakes. When avoiding wheat flours that contain gluten, there are many other types of flours that one can use in its place, such as rice, sorghum, or tapioca flours which are still high in carbs. Since we are also on a low carb diet to promote weight loss, we choose to use the alternatives of almond or coconut flours. 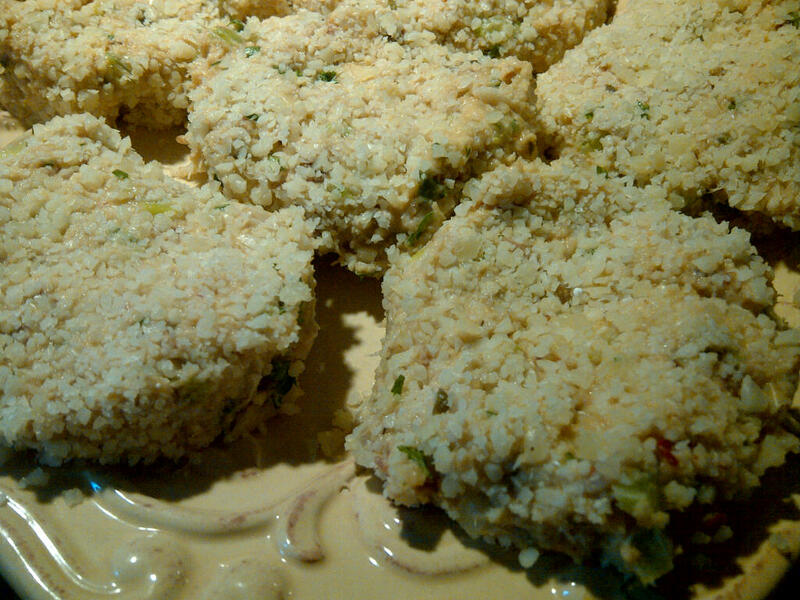 This is a crab cake recipe that I came up with for our Friday night treat, and I chose to use coconut flour because I felt that the slightly sweet taste would work well with the sweetness of the crab meat and the heat of the chipotle pepper, while acting as a glue to hold the delicate patties in shape. 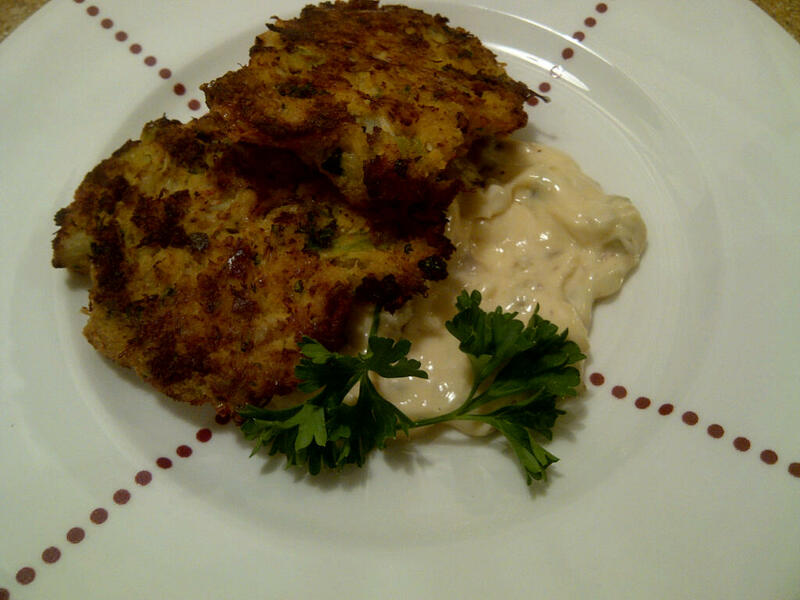 Crab cakes often have fillers such as potato, which increases the carbs and can also disguise the flavor of the crab… I skipped this, since we like our crab cakes to be ALL about the crab.The Parmesan cheese takes the place of breadcrumbs as a coating, and browns up nicely in the oven. This is similar to the method used in Parmesan Perch. Crab cakes should be refrigerated for a minimum of 30 minutes prior to baking, to help them hold their shape. 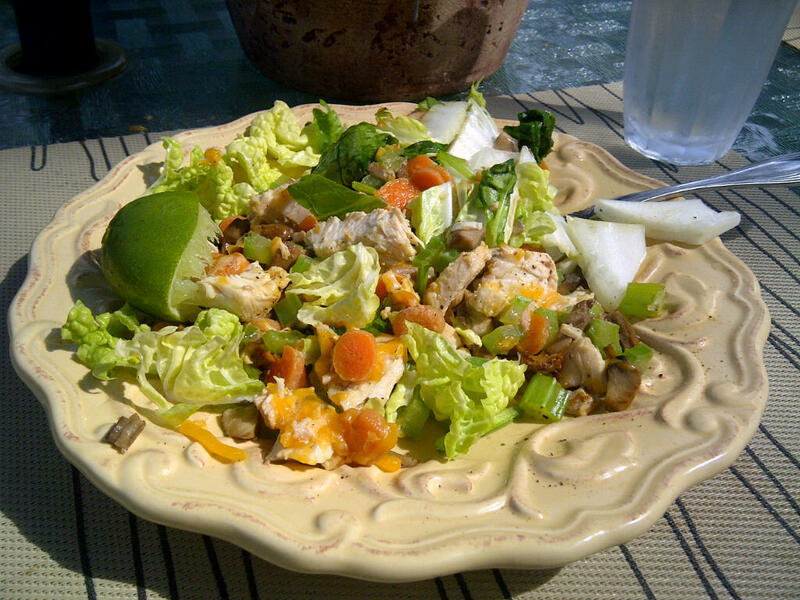 Saute the celery and leek in coconut oil until tender, 2-3 minutes, and set aside. In a medium bowl, mix together egg, mayonnaise and cream. Gently fold in the crab meat. Add the leeks, celery, chipotle pepper, capers and parsley, mixing gently. Add coconut flour, 1 Tb at a time, mixing well. Add salt and pepper to taste. The mixture will be soft, but should be manageable. If it is too delicate, add a small amount of additional coconut flour. Divide mixture into about 6 medium patties, dredging each one in the grated Parmesan cheese before setting on a plate. Refrigerate at least 30 minutes to chill cakes and make them a little easier to handle. When they are chilled, bake at 450 degrees on a silicone baking mat or parchment-lined sheet for 10-12 minutes, or until lightly browned. Serve immediately with tartar or roumelade sauce. Sauce: The sauce I used was a base of 1/2C mayo and 2Tb cream seasoned with a finely diced gerkin pickle, dash of hot sauce, 1/2 diced chipotle and 1tsp dijon mustard with a squeeze of lemon.